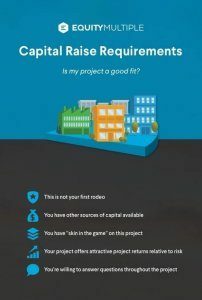 As you get up to speed with EquityMultiple, and the real estate crowdfunding landscape more broadly, here are some things to keep in mind with respect to due diligence performed on real estate investments. Depending on your definition, there are now dozens to well over 100 “real estate crowdfunding” platforms operating in the U.S. alone, with hundreds more emerging across the globe. As an individual investor managing your own portfolio, the vast array of options can be overwhelming, and certainly not every one of these platforms merits serious consideration. Which platform (or platforms) is right for you? Debt investing: Some platforms take some or all of an existing real estate loan, secured by a deed on the underlying property, and syndicate it out to a network of individual investors at a fixed rate of return. Other platforms act as the lender, issuing a loan to a real estate developer or flipper. In either case, the platform’s network of investors are offered a flat annual rate of return – typically between 7% and 12% – over a relatively short term – generally 6 to 18 months. Since these investments are secured by the property and short in term, they tend to be a good fit for more risk-averse investors. eREITs: Fundrise and RealtyMogul, two of the original players the real estate crowdfunding space, have pivoted to offering semi-blind funds that aggregate properties throughout the country. These investments offer built-in diversity and very low minimums, making them appropriate for less experienced investors. Note: EquityMultiple offers a combination of the first two models. Understanding these categories can help you determine which kind of platform best suits your portfolio and investing strategy. Given the relatively low minimums many platforms offer, there may be room in your portfolio to invest through several platforms to achieve further diversification. Regardless of what model a platform operates under, be sure to take a look at the experience and track record of the people behind the platform. Make sure that they are willing and able to answer questions you have, regarding either individual investment opportunities or the platform itself. Risk factors – No investment is without risk, even fixed-rate, short-term debt investments. Examples of risk factors are tight construction timelines, a precarious labor market in the area, an unsubstantial track record or aggressive leverage on the part of the Sponsor who originated the deal. Again, if risk factors aren’t presented transparently, or the platform is unable or unwilling to field questions about risk factors, this should raise a red flag. Payout structure – While debt deals are mostly straightforward, equity investments can be much more complex. Be sure to understand where your investments fits in the capital stack, and what order you will be repaid principal and profits relative to the Sponsor and other LP investors. Cash flow and liquidity – Simply looking at how many dollars you’re expected to receive over the lifetime of a deal (the simple return) or even a time-weighted return (IRR – internal rate of return), won’t give a complete picture of the timing and magnitude of returns. 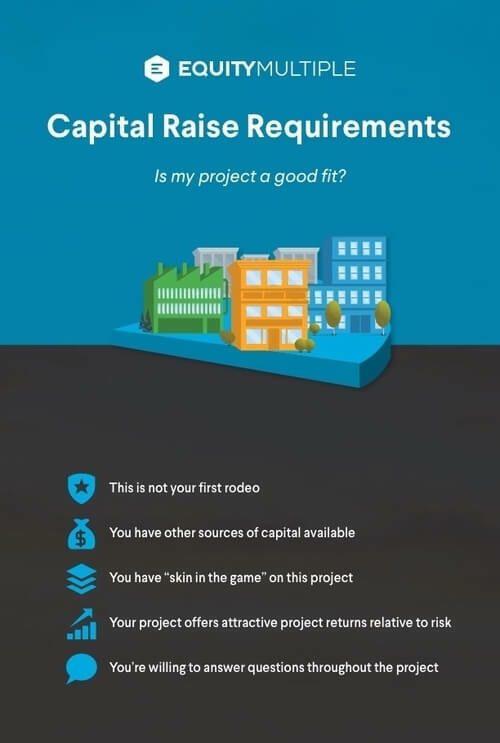 Depending on the business plan for the project and how the platform has negotiated and deal, you may receive distributions monthly or quarterly, and you may begin receiving cash flow from rent immediately, at some point partway through the term, or not at all in the case of a ground-up development or rehab. Similarly, repayment of principal may be projected for the end of the term, partway through the term, or piecemeal in the case of partial sales or a refinance. Be sure that the schedule of distributions and principal repayment is palatable to you given your liquidity needs. Once again, if any aspect of the deal is unclear or doesn’t pass the sniff test, don’t hesitate to ask questions of the platform offering it. While some platforms merely act as posting platforms, EQUITYMULTIPLE performs substantial diligence on potential investment opportunities, and on the real estate companies that brought us the deal. And, for each potential offering, we also examine the sponsor company’s own underwriting of the offering, verifying that it was done conservatively, thoroughly, and expertly. All of this amounts to a rigorous gauntlet of due diligence that you can imagine as a funnel; only a select few investment opportunities make it through these multiple layers of diligence, and ultimately get featured on the EQUITYMULTIPLE platform. To date, we’ve closely evaluated over 500 real estate projects, with around 6% surviving to be presented on the platform and opened to EQUITYMULTIPLE investors. Here are some (but not all) of the items we closely examine throughout the underwriting process. Any red flags along the way can remove the project from our consideration entirely. Analyzing all of this information can take several weeks. Fortunately, a number of our partner real estate companies – with whom we’ve worked on several projects – are able to quickly furnish much of this information, streamlining the process. The advent of real estate crowdfunding makes real estate investing accessible to a much broader segment of the population, dramatically lowering barriers to entry. Just because real estate transactions are moving online, however, doesn’t mean that time-tested modes of real estate analysis are no longer valid. Due diligence remains a human practice, predicated on experience. As an individual investor, you do not need to understand every nuance of the due diligence process. It is important, though, that you are aware of each key diligence item, and that someone – you or the platform you invest with – is tending to each. EquityMultiple's team features real estate industry veterans, technology-driven analysts, and dedicated armchair economists.